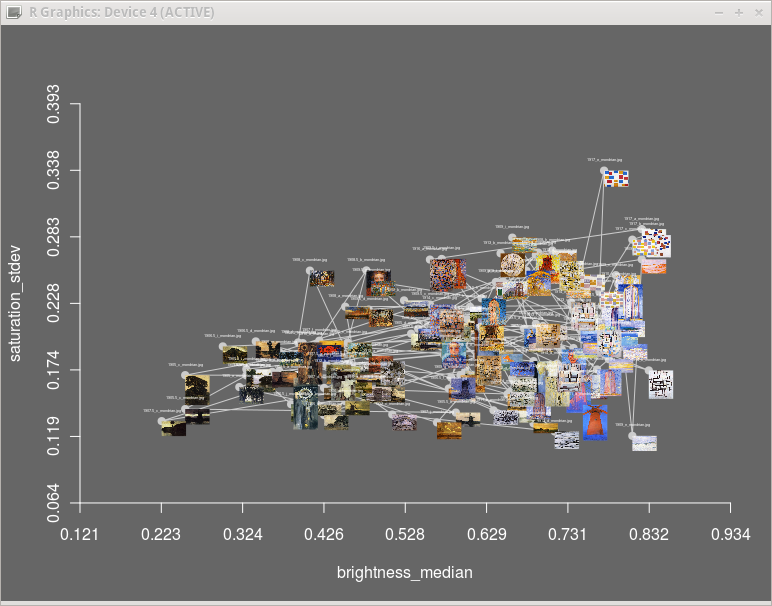 Cultural Analytics for the Digital Humanities in R.
CulturalAnalytics is an R package containing functions for statistical analysis and plotting of image properties. It is intended for use in the digital humanities, in art institutions, by art historians and critics, and by anyone who wishes to examine digital or digitized images. CulturalAnalytics provides functions for obtaining statistics such as the standard deviation and mean in the RGB and HSV colour spaces, for image entropy and histograms in greyscale (intensity) and colour, and for plotting colour clouds and image scatter charts. The project summary page can be found here.